Knowing when and how to hire a sales rep can be one of the toughest decisions a home care provider will face. Do you hire one upon opening or wait until you have enough revenue? How do you know if they are a good fit for your company? Let’s take a look at this predicament and see what light we can shed on it by reviewing the industry data and sharing tips for hiring your ideal candidate. Many home care providers start their home care agency because they are driven by a desire to make a difference. When you started your home care agency, you did it for a reason. Whether it was personal or business related, you started it knowing you wanted to make a difference in senior care. Often, home care providers will lose sight of their WHY and this can make business difficult. When hiring a sales rep, revisit your WHY and determine if a change like this will keep your business on the correct path, and ensure you are hiring the right sales rep for your home care. 2. What are Industry Leaders Doing? Revenue can play a large part in when to hire a sales rep. In the 2017 Home Care Benchmarking Study, Home Care Pulse analyzed data from more than 600 home care businesses across North America. We found that there isn’t one distinct revenue level where most sales reps are hired. 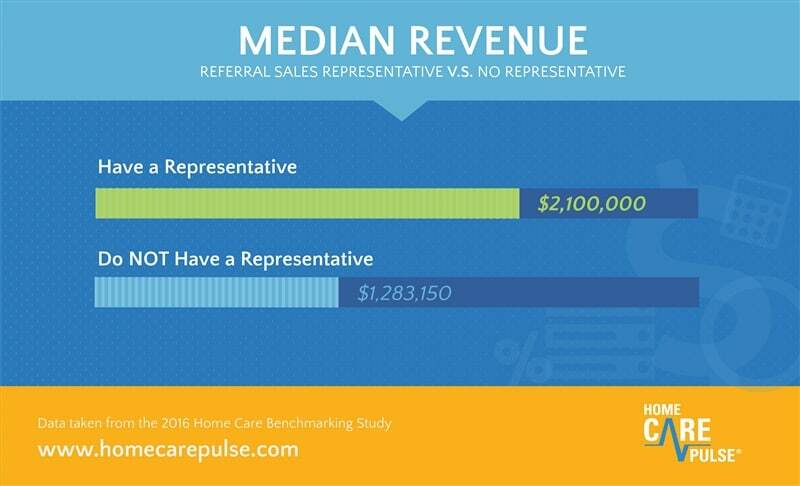 According to our 2017 Study, those home care providers who hired a sales representative saw a average revenue of $2.1 million versus $1.2 million for those providers who didn’t hire one. It is also worth noting that industry leaders (businesses with annual revenue of $2.4 million or more) tended to hire a sales rep early on. 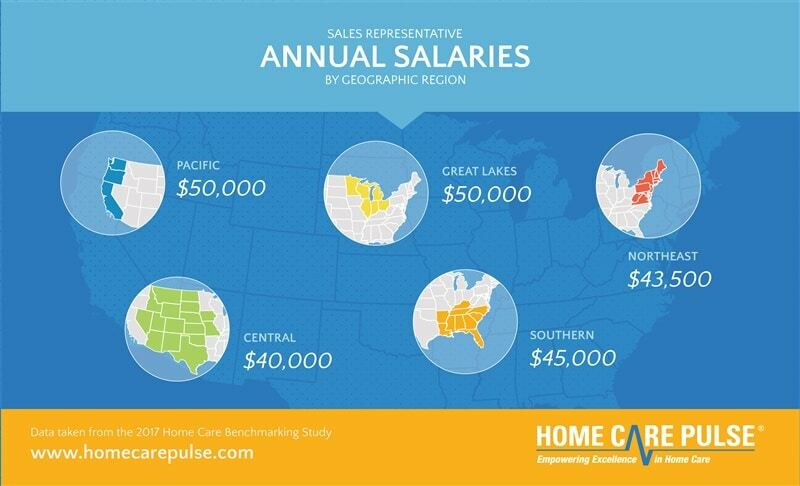 The data seems to suggest that hiring a sales rep can have a significant impact on growth. But even after you’ve decided that you’re ready to hire a sales rep, there are still some things to think about. Your ideal candidate will have a history of making sales, achieving goals, and growing a business. Their track record may be one of the greatest indicators of future success so be sure and do your homework. Look for someone who is self-motivated and can work independently. Even more crucial for new businesses, finding someone who can mesh with your current culture and get along with a close-knit group of team members is extremely important. A sales rep needs to be able to start a conversation anywhere and anytime. You want someone who is a good communicator and someone who will make a great impression for your company. Rejection is part of the job description for a sales rep. You need to hire someone who can get right back up after being pushed down. They need to be resilient and unaffected when they are denied by a potential client. If your home care business is still getting off the ground, your ideal candidate should have some experience working for a new business. Maybe they can take rejection well, but can they take your advice and coaching? You need someone who can work with you and adapt. Your ideal candidate will be motivated by more than just their commission. Find someone who shares your WHY—someone who believes in the impact your services have on your clients and has a sincere desire to help more individuals in need receive in-home care. Based on the data from the 2017 Study, it’s clear that hiring a sales rep can have a drastic impact on the growth of your home care business, but don’t rush into a decision without evaluating your specific situation, needs, and the numbers that support or go against such a decision. This is the only way to be confident that hiring a sales rep is the right call for your growing home care business. Get the Sample Sales Rep Position Agreement.